Harold Miller ’03 was a history major at IC. The bachelor of arts degree in history is in the School of Humanities and Sciences. The faculty in the history department have expertise in U.S., European, Latin American, Asian, and Middle Eastern histories, among others. The students of ALS are committed to promoting the cultural, political, social, and economic welfare of students of color on campus. When a worker at Wendy’s was fired from her job in 2012 for taking a stand against unfair wages, Harold Miller ’03 decided to stand with her. In fact, as a community organizer, he arranged to have other workers and supporters take a stand, too. The demonstration led to the woman getting her job back. Now, years after graduating from IC, Miller is leading in another capacity, under the mentorship of New York City’s mayor, Bill de Blasio. Miller is the deputy commissioner for civic engagement in the mayor's Office of Community Affairs for the City of New York. Miller began his leadership track as a first-year student with the African-Latino Society (ALS) at IC, which aims to promote the cultural, social, economic, and political welfare of students of color. From his position in internal affairs, Miller rose through the ranks of the general body and executive board and became president of ALS his senior year. Miller’s job as deputy commissioner is to ensure that the office is aware of issues in the community. Most of his days are spent interacting with the community, either on the phone or in person, to get a sense of what’s going on. “I spend a lot of my day getting feedback, keeping my ears to the ground on what is happening within neighborhoods in New York City, so the administration can have a pulse about what’s going on,” Miller said. 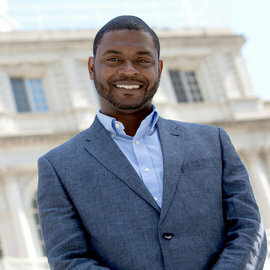 Before working in the mayor’s office, Miller worked in the nonprofit sector with the Association of Community Organizations for Reform Now (ACORN) and later with New York Communities for Change, where he led the wage strike for fast-food workers. With ACORN, he also assisted low-income families by organizing efforts to improve access to affordable housing, education, and a living wage. Miller majored in history and said Professor Zenon Wasyliw was one of several mentors. Miller says his academic experiences and involvements at IC launched him into his career in organizing and helped him perfect his craft. The skills he learned through ALS had real-life applications for working with people. Whether it was conflict resolution or moving people to care about certain issues, Miller said ALS exposed him to the inner workings of organizing. “I learned about how to deal with conflict in a real way,” he said. “ALS helped me to figure out ways to talk to people and organize them to move on issues, whether it be education or housing, police, whatever.” Miller said the challenging moments he experienced in ALS still aid him when difficult situations come up.